In a ballroom in Bally's Vegas casino, kids are lined up on either side of a table with soldering guns melting metal to metal. Their small hands deftly join LED to circuit board, while a few feet away other children are learning the basics of developing. In the back of the room, a group of children and their parents watch two preteen girls give a presentation on the cryptography found in a TV show. This is R00tz Asylum, the kid-friendly portion of the Def Con hacker conference. From the first-timers ripping apart various electronics to see what makes them tick, to the teenage hacker "CyFi," who revealed her first zero-day exploit at age 10, R00tz is exposing children to the world of white-hat hacking to make the future of our digital world a bit safer. This conference within a conference started five years ago. Teenagers had been attending Def Con for years, but according to co-founder Nico Sell, the idea of bringing young children was a subject of controversy among veteran attendees. While the event is designed to be inclusive, it's also adult-oriented with first-time speakers having to take a shot on stage and language that's more at home in Mad Max than The Lego Movie. The R00tz sessions are designed to explain hacking in a way that kids new to the scene can understand. It's less intimidating than the regular conference, but it doesn't skimp on the technology know-how, either. Sell estimates that 500 kids and parents participated in R00tz Asylum this year and that 80 percent were the children of veteran Def Con attendees. The recommended age range is 8 to 16, but I saw kids who were almost certainly younger than that. All that matters is that the child can grasp the concepts being presented. Regardless of age, it's not a day care center; parents need to stick around. But from the looks on the faces of parents sharing their love of technology with their offspring, that wasn't an issue. Also, like their adult counterparts, the kids are told to adhere to a code of conduct and only hack their own devices. It's a code that will hopefully stick with them as they eventually move on to the larger Def Con convention as adults. But when that happens, R00tz Asylum will become off limits; adults are only allowed when accompanied by a child. The Tesla and garage door hacks that made a huge splash at the Def Con conference (and in the media) were also presented to the children at R00tz Asylum. In addition to hacking, the program touched on larger issues, including a talk with author Cory Doctorow about abolishing DRM. The Electronic Frontier Foundation also shared its work on privacy and civil liberties. Whatever the topic -- whether they were watching a presentation or trying their hands at lock picking -- the children were completely focused on the task at hand. It was actually weird. I expected at least a few kids to seem bored, wishing their parents would just let them play on their tablets. I thought there'd be at least a few rambunctious girls and boys running about causing problems. Instead, the only running I saw was between workstations and the only voices I heard were questions about soldering, lock picking or hardware components. It turns out children really love learning. The end game is to get kids excited about a career or at least a hobby in security research (aka hacking). But it's not exactly presented that way. "If you say to a group of kids, 'Hey, who wants to learn about security and privacy,' two kids raise their hand," said Sell. "If you say, 'Who wants to learn to eavesdrop on cellphones or hack a Tesla?' every kid will raise their hand because it's fun." That's a good thing, because as more and more devices get embedded computers, there's going to be a bigger need for more security researchers. And that, says Sell, presents a problem. "We have a huge shortage of hacking skill set in the adult population," she said. Indeed, the think tank Rand Corporation highlighted the security researcher shortage in the US and its impact on national security in 2014. Those researchers have to come from somewhere and right now it looks like they're not coming from the nation's schools. In particular, according to the Department of Education, only 16 percent of high school seniors are proficient in math and interested in science, technology, engineering and mathematics (STEM) careers. More alarming, the US is ranked 25th globally in math and 17th in science among industrialized nations. "I'm into building and destroying." Plus, there's the issue of diversity. While I saw more female attendees at Def Con than at other tech events, it was still heavily male-dominated. The R00tz area, at least, looked to have a 50/50 split of girls and boys both attending and presenting. I spoke to a few of the kids while they worked on their projects. At least I attempted to talk to them. Only one child actually gave me her full attention and that was only because someone was fixing an issue with her LED sign project. The eight-year-old was here with her parents and spent last year ripping electronics apart. 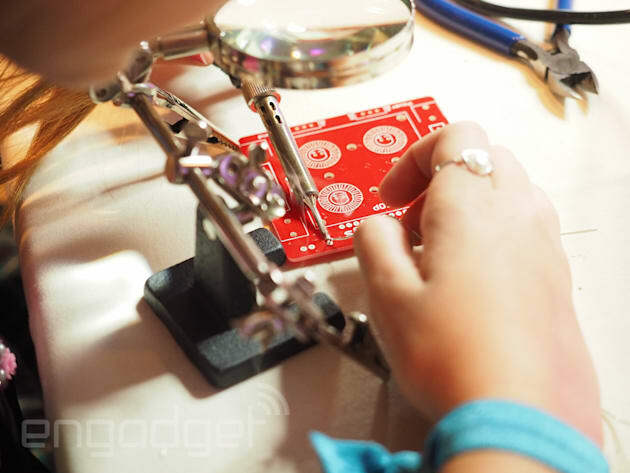 This year she spent most of her time at the soldering workshop, "I'm into building and destroying," she told Engadget. It was her second project of the day. The first was an Ethernet sniffer. After a minute or so, she wanted to get back to her project. Chatting with a journalist isn't a priority; solving problems and building things are far more important.